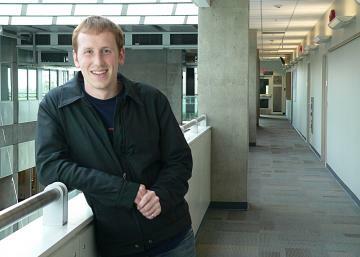 As a result of this early exposure, he says, he has more of a theoretical physics and math background than other students—something that may help to explain his academic success: Fryer, who is graduating this month, is receiving the Canadian Society for Mechanical Engineering Gold Medal for highest graduating GPA in his class. He also received the Faculty of Engineering Dean’s Entrance Scholarship, a UVic Excellence Scholarship, the Cunliffe Engineering Scholarship, and Norman Yarrow Scholarships in Engineering—twice. But, he says, he didn’t do it alone, and thanks his classmates, friends, family and professors—including Dr. Rodney Herring, his thesis supervisor, and Dr. Tom Tiedje, the Dean of Engineering—for their support. The heavy workload makes the engineering community particularly important, and activities such as the Order of Pi, the Engineering Students Society and even a pick-up game of football after a difficult exam stand out for Fryer. Fryer completed co-op placements with the military, Kodak, General Motors and the team of Dr. David Sinton, which was working on a device for early detection of ovarian cancer. He also undertook a research term and built a confocal acoustic holography microscope—it uses sound to build a 3D image of soft tissues—for his honours project. “The end result was that I got a really good, broad range of opportunities in different fields related to engineering,” he says. He also spent four months volunteering in Calgary and Uganda with Engineering Ministries International, a non-profit Christian development organization that designs buildings to serve the poor. Fryer is spending the summer working for Tiedje and is considering attending grad school—he is looking at UVic and the University of Waterloo—and focusing on energy systems.